Derived from the Greek word for blood, Hematite is one of the most abundant minerals on the Earth’s surface. Hematite (and Magnetite) are mined to produce nearly every bit of iron and steel in use today, from paper clips to locomotives, bicycles to skyscrapers. The state mineral of Alabama, Hematite is found throughout the globe … and has even been found on Mars! Polished Hematite chunk — maybe the perfect “worry stone”! Cave paintings used pigments made from Hematite. Ancient Egyptians placed Hematite in their tombs. Native American warriors made war paint from Hematite to protect them in battle. Long-ago peoples believed Hematite deposits came about from battlefield injuries and soldier deaths. Geology students quickly learn to recognize Hematite from the reddish streaks it leaves behind. Hematite ranges in color from red to brown and black to silver. As a gemstone, it’s found as cabochons, beads, and tumbled stones and is prized for its weighty feel and glossy luster. Reconstituted Hematite can be made into magnetic beads that are popular with some jewelry makers and wearers (though healers say the beneficial properties don’t carry over). Hee Hee, a Happy Face made from Hematite rondels, 6 mm round beads, and a bracelet of 4 mm round stones. Ranging from a 5.5 to a 6.5 on the Mohs scale of hardness, Hematite is an outstanding stone for mental, physical, and spiritual healing. Hematite is believed to help calm a person, decrease negativity, heighten self-confidence, and reduce stress. It’s a stone of optimism, grounding the mind, and enhancing focus and concentration. Feng Shui practitioners advise placing Hematite in the North/Career area of a home to tap into its power. Metaphysical healers use Hematite to balance the Root Chakra. 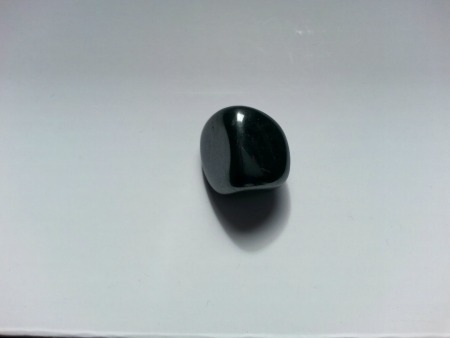 Healers believe Hematite aids with anemia, broken bones, backaches, insomnia, and overcoming addictions. Tuck a piece of Hematite in your purse or pocket. Wear jewelry made from Hematite, particularly on your arm or ankle. Care for your Hematite by not exposing it to harsh cleaning chemicals; instead, clean it with warm soapy water. Remove Hamatite for physical activity like sports. This entry was posted in Sunday's Gem and tagged healing gemstones, healing hematite, properties of hematite. Bookmark the permalink. I’m sure I’ve seen this stone without knowing what it was. It’s beautiful when polished up, that’s for sure. I smiled when I saw that some think it will help with addictions. Perhaps it could help me stay away from ice cream. Should I put some in my freezer? I had no idea it’s used to make iron and steel. I’m glad it’s so abundant! Who can resist ice cream, especially when temperatures climb into the 90s?!? I imagine even a chunk of hematite wouldn’t “work” against that strong a pull!! The thing I especially love about hematite is its weighty feel. It just feels right in my hand … and on my arm, ha! Whether it does all it’s cracked up to do is beyond me. Ooh, I want some Martian hematite! It’s another lovely stone isn’t it – such a good gleam to it. Haha – love your smiley face! Wow Debbie, that is so interesting!!! I know this stone because of my involvement with gemstones and energy work, but had no idea about it even being found on MARS?!?! Yup, you’re absolutely right about that because red is the color of the Root Chakra, which is the Chakra that grounds us to the earth. LOVE the bracelet you made (and the smiley face). It’s so beautiful! You are very talented, my friend! Thanks so much for sharing yet, another interesting and informative post on gemstones. Have a super Sunday! Ron, I’m learning so much from the research for these gemstone posts. Of course, all of us have our favorite stones, but opening our minds and hearts to new ones can be very helpful. Thanks for confirming the bit about the root chakra. I’ve seen photos online of folks with huge stones placed strategically along their spines — that’s sort of what you do, isn’t it? I imagine it’s very rewarding to be able to help somebody feel better without poking needles into them or filling their systems with man-made drugs. Thank you for the introduction to Hematite. I love it. Thank YOU, John, for taking the time to stop by. Hope you’re enjoying your travels! I’m heading over to catch up with your blog right now. This is a gem I’ve never heard of, Debbie. Such interesting facts and possibilities with this one. Seriously?? Okay, I’m glad I decided to feature it then. 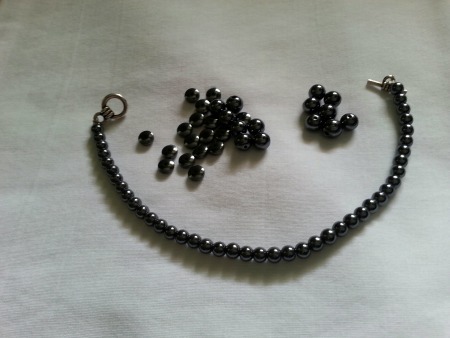 I’ve used hematite in my beaded jewelry for years. It goes with almost everything; I’m delighted it carries so much potential for good, too. It is such a sleek gem! And your plethora of useful information lead me to wonder if this stone is connected to one of Zeus wife Hera. Nope. I do have a bracelet made from Hematite—I think I’ll wear it a little more often! Thanks so much, Katybeth. I probably should wear my hematite bracelet more often, too. Even if it doesn’t “work,” it’s pretty!! I love hematite, Debbie! I had no idea they found it on Mars. Your reference to geology students made me chuckle. I took two semesters of Geology to satisfy my college science requirements. I have fond memories of being in the lab and identifying all those stones. I have a hematite bracelet, and I love the smooth, weighty feel of it. I enjoy your gemstone posts! What a coincidence — I, too, took two semesters of Geology (no way was I tackling Chemistry, ha!). I found out very quickly that I didn’t inherit my dad’s passion for it, probably because my OLD professor droned on and on and class-time coincided with what should have been a mid-afternoon siesta!! Glad you enjoyed this post, Lana — I loved writing it! I wasn’t about to do Chemistry or Biology, ha ha! I was a bit luckier than you in the professor department, my Physical Geo professor was young and super nice looking. That always helped, lol! One reason I majored in Journalism, hee-hee!! Again – an interesting post on a specific gem and its beauty and possibilities. And again – what a beautiful jewelry set. I do energy work with people, but have not used stones, except in the space where I work, and am always nodding my head in agreement with your posts on stones, as well as learning new aspects. Love it! Gee, thanks, Barb. I learn a lot from doing the research into these posts, too. Of course I can’t keep all of it catalogued in my head, but it’s nice to have a specific spot to go to where I can refresh my memory.